Facilities: FCI Three Rivers with an adjacent minimum security satellite prison camp. 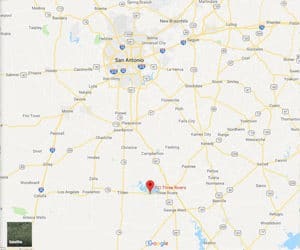 Location: FCI Three Rivers is located about 80 miles south of San Antonio and 73 miles northwest of Corpus Christi, off I-37 on Highway 72; 8 miles west of the town of Three Rivers, across from Choke Canyon Lake. Background: FCI Three Rivers was opened in 1990. The Satellite Prison Camp is located adjacent to, and provides support services for, FCI Three Rivers. A notable incident in 2008 involved a riot between two rival gangs, leaving 22 inmates injured and one dead. Health Services: Within 14 days of arrival, inmates are given a complete physical examination. Sick call, dental call, emergency medical services, eyeglasses, chronic care, medications, physical examinations, HIV testing, and immunizations are all provided at FCI Three Rivers and the satellite camp. Emergency medical care is available 24 hours a day. Psychology Services: Services provided by the psychology staff are crisis intervention, individual and group therapy, and psycho-educational programs (e.g., Anger Management, Stress Management, and Communication Skills). Notices of upcoming offerings are posted on bulletin boards in inmate housing units. Residential Drug Abuse Program (RDAP): FCI Three Rivers and the camp do not house a Residential Drug Abuse Program (RDAP), but do refer to facilities that do provide the program. Both facilities offer drug treatment programs, relapse prevention groups, a Drug Abuse Education Program, and the Non-Residential Drug Abuse Treatment Program (NR-DAP). Education Services: FCI Three Rivers offers literacy, GED, and English-as-a-Second Language (ESL) programs. Graduation ceremonies are conducted once a year for students completing GED, ESL, and vocational training classes. A bonus of $25.00 is awarded for completion of GED, ESL or VT programs. Certificates from the institution are also awarded for completion of ACE, Parenting, GED, and ESL classes. In addition, a Student of the Month is chosen each month from classes in the Literacy program for significant progress in their studies as well as dedication and hard work. The Student of the Month is rewarded with a day off from school and work cleared through the Supervisor of Education and Unit Manager. Upon completion of each 240 hours of satisfactory progress, students are awarded a day off from school. Other incentives are awarded based on progress through the Literacy Program. A parenting program and Adult Continuing Education (ACE) courses are also offered. An employment resource center is also available to assist inmates within 24 months of release prepare for post-incarceration. High school diplomas and post-secondary programs are available through paid correspondence programs. Advanced Occupational Education: FCI Three Rivers and the camp offer advanced occupational education in Building Trades, HVAC, Microsoft Applications, and Welding. The camp offers General Automotive, HVAC, Microsoft Applications, and Wastewater Instruction. Vocational Training: FCI Three Rivers does not offer any vocational training programs aside from its advanced occupational education programs. Apprenticeship: FCI Three Rivers and the camp offer apprenticeships in Electrical Apprentice, HVAC, and Plumbing. Library Services: Leisure and law libraries are available at both facilities. The leisure library has books available for checkout and DVDs available for viewing. Both fiction and nonfiction books, newspapers, and magazines are available for inmate reading. Inmates are provided access to legal materials and an opportunity to prepare legal documents through the use of the TRULINCS Electronic Law Library. A copying machine is available to reproduce materials needed for research. Electric typewriters are also available for inmate use. UNICOR: The FCI Three Rivers UNICOR facility handles fleet management and vehicular components. The camp does not have a UNICOR facility. Commissary: The commissary spending limitation is $360.00 per month on a designated shopping day. The shopping day is based on the meal rotation roster generated by the Institution Duty Officer utilizing the weekly sanitation scores. Over-the-counter medications, copy cards, and postage stamps do not count against the spending limit. Foods, snacks, beverages, clothing, shoes, and electronics are also available for purchase. Recreation Services: FCI Three Rivers recreation activities include hobbycraft (e.g., arts, leather craft, painting, beadwork), leisure, and fitness programs (e.g., walk/run club, abdominal fitness workout, yoga), intramural sports, and a band/music program. Activities including basketball, soccer, softball, flag football, handball/racquetball, bocce ball, horseshoes, and volleyball, are also offered.